Review by AllTheBestFights.com: 2018-04-21, very boring fight between Zolani Tete and Omar Narvaez: it gets one star! The former Ibf super-Flw and current Wbo Bw champion Zolani Tete entered this fight with a pro record of 26-3-0 (21 KOs=81%) and he is ranked as the No.3 bantamweight in the world (currently the #1 in this division is Jamie McDonnell). He suffered his last loss when he faced Roberto Domingo Sosa in 2012 (Sosa vs Tete), since then he has won ten consecutive bouts beating Arthur Villanueva (Tete vs Villanueva) and Siboniso Gonya in 2017 (Zolani Tete vs Siboniso Gonya). His opponent, the former world champion in two different weight classes Omar Andres Narvaez, has an official boxing record of 48-2-2 (25 knockouts) and he entered as the No.4 in the same weight class. ‘El Huracan’ Narvaez suffered his last loss when he faced Naoya Inoue in 2014 (Narvaez vs Inoue), since then he has won five bouts beating Nikolai Potapov in 2017 (Narvaez vs Potapov) and Jesus Vargas in 2018 (Omar Andres Narvaez vs Jesus Vargas 2). 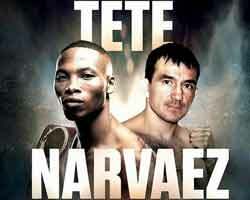 Tete vs Narvaez is valid for the WBO World bantamweight title; undercard of Carl Frampton vs Nonito Donaire. Watch the video and rate this fight!